Digestive concerns? Think Digesti-Pan. Why? Because enzymes are involved in every stage of the digestive process  and most of those are secreted by the pancreas. Balance and harmony are important to the entire process because, remarkably, insufficient enzymes can contribute to constipation and insufficient enzymes can contribute to diarrhea [2-3]. Active enzyme levels often decrease with age  (complaints of indigestion tend to increase with age). The primary point of digestion is to get food particles small enough to be absorbed . Through the process of mastication, food is broken down into smaller pieces. Saliva contains the enzyme amylase which helps digesting certain starches. In the stomach, hydrochloric acid and pepsin are released along with various proteolytic (protease) enzymes. From the stomach, the digested food (now called chyme) enters the duodenum. If lipids are detected, the hormone cholecystochinin is released. This triggers the gall bladder to secrete bile into the duodenum. Bile emulsifies lipids so that they can be digested. When the chyme enters the duodenum, the pancreas secretes a solution of sodium bicarbonate and various enzymes (such as amylase, lipase, and protease) [2,3]. These enzymes digest their respective portions of the chyme (i.e. lipase digests the lipids); however if the chyme has not been properly broken down through mastication, stomach digestion, or bile, indigestion can occur ). Digesti-Pan contains a combination of enzymes, herbs, and digestive-promoting substances to nutritionally support the digestive processes. 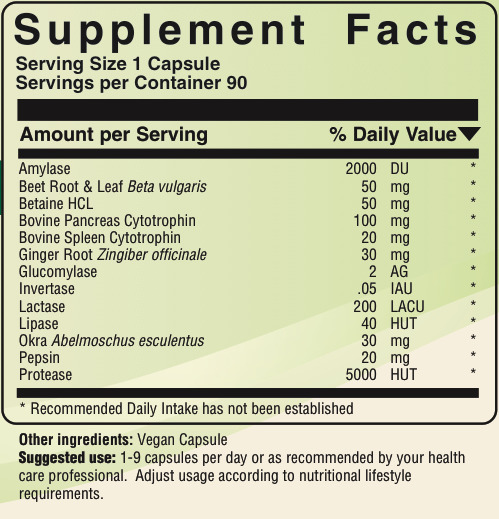 Oral consumption of digestive enzymes, digestive herbs, and fiber have all been shown to improve digestion [1-5]. Amylases are enzymes which are needed to digest starches and related carbohydrates . Specifically, amylases “catalyze the hydrolysis of alpha-1, 4-glycosidic linkages to polysaccharides to yield dextrins, oligosaccharides, maltose, and D-glucose” . “Amylases are used as digestants” . Beet root is an herb which provides fiber and “is used as supportive therapy in diseases of the liver and fatty liver” . It is believed that this is probably due to the fact that beet contains betaine . Betaine is a metabolite of choline . “Betaine hydrochloride is a delivery form of hydrochloric acid” which is needed to digest proteins . “Some with hypochlorhydria have used betaine hydrochloride alone, or in combination with pepsin, as a digestive aid” . HCL is also part of the gastric barrier that fights parasites . Pepsin is included with betaine hydrochloride in Digesti-Pan. Bovine spleen supplies spleen tissue. The spleen is the body’s largest lymphatic organ. “The pulp of the spleen contains many large reticuloendothial cells, and the venous sinuses are lined with similar cells. These cells act as a cleansing system for the blood, acting in concert with a similar system in the venous sinsuses of the liver” . The spleen tissue in Digesti-Pan is from New Zealand. Crude and dietary fiber is contained within the herbal ingredients of Digesti-Pan [7,8]--both fibers are important for human health. Few women meet the National Cancer Institute recommendations for consuming 20g of fiber per day . Dietary fiber helps regulate nutrient absorption, sterol metabolism, cecal fermentation, and stool weight . Shortages may lead to cholesterol problems, certain cancers, digestive problems, and nutrient problems [9,10]. Ginger root is an herb that contains fiber and can reduce nausea . “Modern uses include prophylaxis for nausea and vomiting (associated with motion sickness, hyperemesis gravidum and surgical anesthesia), dyspepsia, lack of appetite, anorexia, colic, bronchitis, and rheumatic complaints” . It also “promotes secretion of saliva, gastric juices and bile” . Its ability as an anti-emetic was proven in a double-blind trial were it was shown to prevent motion/sea sickness . Glucomylase is an enzyme for the digestion of maltose. It also “is the enzyme responsible for the hydrolysis and absorption of short polymers of glucose”  and appears helpful to reduce diarrhea . Invertase is an enzyme for digesting sucrose. It “attacks beta-D-fructofuranoside (raffinose, stachyose and sucrose” . “Invertase activity is stable between pH 2.6 and 5.5...maximum activity observed at pH 4.5” . Lactase is an enzyme for digesting lactose. “Lactose intolerance is a benign gastrointestinal disorder caused by a deficiency of lactase necessary for the digestion of milk sugar” . Lipase is an enzyme which helps digest lipids (fats) [2,15]. Nearly all the digestion of lipids occurs in the intestines. Okra “In Asian medicine the fruit of the okra plant, Abelmoschus esculentus (L.) Moench., is used as a mucilaginous food additive against gastric irritative and inflammative diseases ” . It has also had similar uses by natural health practitioners in the Western world. Substances within okra have been found to inhibit the adhesion of the Heliobactor pylori in humans . Okra also is a source of fiber . Ovine Pancreas Concentrate supplies pancreatic tissue. “Pancreatic secretion contains enzymes for digesting all three major types of food: proteins, carbohydrates, and fats…The more important proteolytic enzymes are trypsin, chymotrypsin, and carboxypolypeptidase…The pancreatic enzyme for carbohydrates is pancreatic amylase, which hydrolyzes starches, glycogen, and most other carbohydrates…The main enzymes for fat digestion are pancreatic lipase, which is capable of hydrolizing neutral fat into fatty acids and monoglycerides; cholesterol esterase, which causes hydrolysis of cholesterol esters; and phospholipase, which splits fatty acids from phospholipids” . The pancreatic tissue in Digesti-Pan is from New Zealand. “Pepsin is the most important peptic enzyme in the stomach…One of the important features of pepsin is its ability to digest collagen, an albuminoid that is affected little by other digestive enzymes. Collagen is a major constituent of the intercellular connective tissues of meats…Consequently, in people who lack peptic activity in the stomach, ingested meats are less well penetrated by the digestive enzymes and, therefore, may be poorly digested ”. Pepsin works with betaine hydrochloride as an aid in protein digestion [4,6]. Protease enzymes help digest proteins . Although the primary area that proteins are digested is the stomach, further breakdown occurs in the intestines as well. 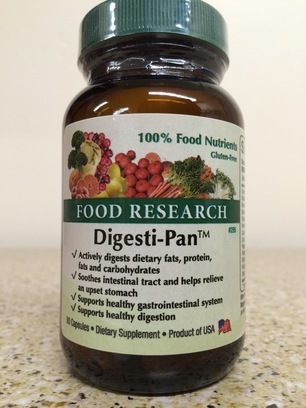 The 100% Food Digesti-Pan formula contains the enzymes, herbs, glandulars, and fibers that can help optimize digestion (it is also supplied in vegetarian capsules). It is no wonder that when they think of digestive nutrition, that doctors interested in natural health think Digesti-Pan.